For more immediate information on dentures and denture types provided at Dental Associates of Cumberland in Cumberland, RI, please contact our dentist office by contact form or by phone at (401) 723-0350. 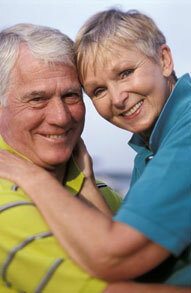 An advantage of immediate dentures is that the wearer does not have to be without teeth during the healing period. However, bones and gums can shrink over time, especially during the period of healing in the first six months after the removal of teeth. When gums shrink, immediate dentures may require re-basing or relining to fit properly. A conventional denture can then be made once the tissues have healed. Healing may take at least 6-8 weeks. An over-denture is a removable denture that fits over a small number of remaining natural teeth or implants. The natural teeth must be prepared to provide stability and support for the denture. Partial dentures are often a solution when several teeth are missing. Removable partial dentures usually consist of replacement teeth attached to pink or gum-colored plastic bases, which are connected by metal framework. Removable partial dentures attach to your natural teeth with metal clasps or devices called precision attachments. Precision attachments are generally more aesthetic than metal clasps and are nearly invisible. Crowns on your natural teeth may improve the fit of a removable partial denture and they are usually required with attachments. Partials with precision attachments generally cost more than those with metal clasps. For more information on dentures and denture types provided at Dental Associates of Cumberland in Cumberland, RI, please contact our dentist office by contact form or by phone at (401) 723-0350 today!